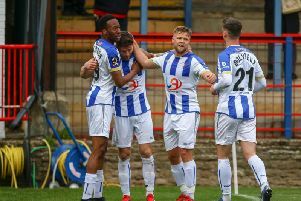 Will Hartlepool boss Craig Hignett give first-team fringe players a chance to shine in the FA Cup? Craig Hignett says Sunday’s FA Cup first round clash with Stamford is not the time for Hartlepool United to experiment. Many a manager will chop and change his players, especially when drawn against lower league opposition. But despite the fact the Evo-Stik Northern Premier League Division One side are four levels below Pools in the pyramid, Hignett says giving a few first-teamers the day off has never even crossed his mind. When asked whether he would use this weekend as an experiment, to give some fringe men a chance to shine, Pools’ gaffer said: “No. We will not be experimenting. “We want to do well in the cup. “I love the FA Cup. The club’s current predicament in League Two has probably dictated this policy, somewhat. Just one point above the drop zone, and with no win in three, Pools could do with a result to get the ball rolling again. Criticism of the players and the manager has been rife in recent weeks. But Hignett is trying to channel that negativity into a catalyst for change. He explained: “We are telling the players that everyone is against us. We just have to crack on with it. “Hopefully these type of decisions and this type of mentality will bring us closer together. “There is a bit of a siege mentality about the place. “I am trying not to pull my hair out. I am trying to make it into a positive. “People keep saying to me that it will even itself out over the season in terms of luck. It needs to hurry up soon because there won’t be enough games left for us to even itself out.